Fresh greens even when the garden is covered with snow? It’s easy, right on your windowsill. Micro-greens may be new to some people, but eating these tiny plants as a flavorful garnish or crunchy topping has been around for years. Recent studies suggest that these “micro” plants can have 4-6 times higher nutritional value than the mature vegetable. Micro-greens are not sprouts, they are seedlings; which includes the stem, seed-leaves and first true leaves (no root or seed coat). Any vegetable, herb or flower with edible leaves can be planted in a shallow container of soil right on your windowsill and harvested within a few days or weeks. Because you’re not trying to produce a mature plant, these tiny seedlings can be grown in the low light of winter without additional heat or fertilizer. If you visit a local farmer’s market, you might find these colorful treats for sale still growing in a seed tray or freshly snipped offered up in a clam-shell container. Many restaurants are adding micro-greens to their farm fresh menu items. Creative Living Community of CT has been growing micro-greens throughout the winter months for years. Their greenhouse in Vernon is a vocational training program for adults with developmental disabilities as well as senior citizens. You’ll find their stand at the South Windsor Indoor Farmer’s Market through December 20th. 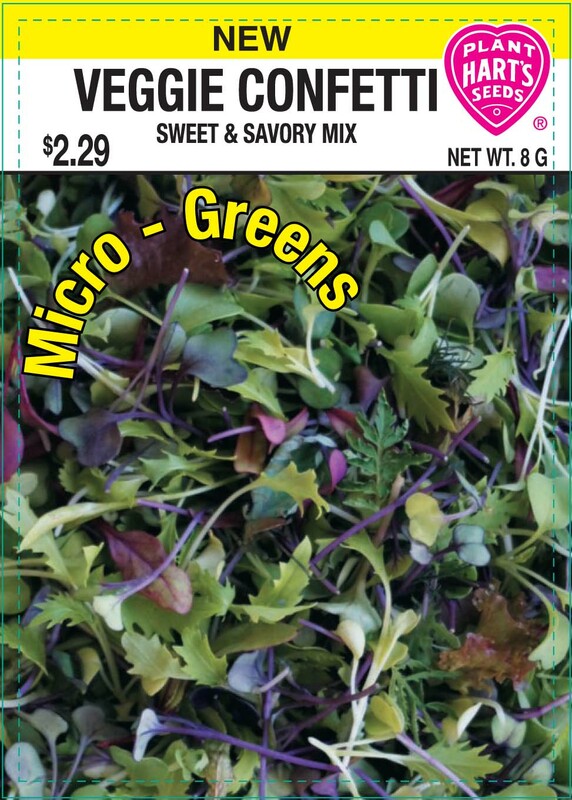 Our team of gardeners at Hart’s Seed spent the summer trialing varieties right here in Wethersfield to come up with a mixture of tastes and colors that could be produced for one or two cuttings of micro-greens. We grew each variety and tasted them ALL. Taste was our first priority, next color and third was time to harvest. Our efforts produced “Veggie Confetti” Sweet & Savory Mix. Natureworks is the first of our retailers to embrace our Veggie-Confetti. You’ll find a sample tray of this mixture growing in their greenhouse and packets available for sale to try at home.